Is this the new Google Nexus 7? Images of what appears to be Google's second-generation Nexus 7 Android tablet have been leaked online, suggesting an official launch of the device is not too far away. Published by Twitter account @evleaks, the images show a Nexus 7 with two rear-facing speakers, a notification light sitting below the screen, and a rear camera. The images also show a visible slot on the left side of the tablet, which many suspect to be a SIM card slot. The original Nexus 7 is currently available with 3G connectivity, but this model only launched in recent months. 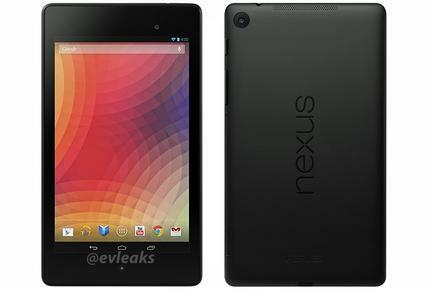 The evleaks Twitter account has a solid track record when it comes to publishing correct rumours and the images leaked appear to be Google's official press shots of the new Nexus 7. The images come just after US blog Android Central published photos of an upcoming Best Buy catalogue listing the new Nexus 7. According to the catalogue, the device will be available from next week (in the US at least) for a listed price of US$229.99. It also reveals the new Nexus 7 will have a screen resolution of 1920x1200, a significant upgrade over the current model's 1280x800 screen. Other rumoured specifications of the new Nexus 7 tablet include a quad-core 1.5 GHz Snapdragon S4 processor, 4GB of RAM, both 16GB and 32GB models and wireless charging capabilitles. The new Nexus 7 is expected to officially be launched at a Google press event scheduled for Wednesday, 24 July. Are you interested in an updated Google Nexus 7 tablet? Let us know your thoughts in the comments below!